Roamer is a cleverly designed app for Android and iOS that aims for savings while roaming abroad. Those prices per minute or per kilobyte can be pretty excruciating as we all know, but the service forwards the calls through your number to a local SIM card so you pay local rates. The only thing you need to do is activate roaming credits from the app in installments of $13, $16, $39 and $65, then get a local SIM from any kiosk when you land. Data is only needed briefly when you activate the card with Roamer and when you initiate the call, and these will be local mobile data rates applied, so nothing exorbitant. The savings are enormous, but above all the call ID is your own motherland number, so you don't have to let everyone know your local cell, or have people wondering who's calling from Europe in this ungodly hour. App versions for BlackBerry and Windows Phone are in the works, too. Interesting... thought this was going to be another Viber type of thing. For travelling abroad, this is a neat solution. Agreed. Two questions: 1. Can one be reached on his regular US number? and 2. Is there a charge to receive calls (since most services outside the US only charge for outbound calls)? 1. When you are travel from US to EU for example, you will be using US number for incoming/outgoing calls. Second, you can use local number for local calls. And of course the most important - local data plan. 2. 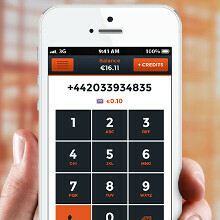 USA to UK will bring you rates of 0.04 eur cents for incoming and 0.08 eur using your US number. (you can check calculator on RoamerApp website. When US callers reach you - they pay as for local US call. Sounds like you are just paying to get your caller id be your own number. Nothing especially fantastic about that unless you can receive calls. Would be useful to clarify this in the article.